There have been quite a few Android tycoon games and building sims released over the past few months, but My Country is worth taking notice of. It comes from the developer of Paradise Island, Game Insight, and it expands vastly on the same basic concept. Instead of being limited to a tourist trap your aim is to craft a vast city with factories, houses, office buildings and parks. You’ll need to ensure that you hire the right staff to keep your various businesses ticking over and you’ll have to balance the population, energy requirements, ecology, industry and services. This is a huge game. It’s tough to think of many other examples on this scale in the Android Market. Luckily it can be installed to your SD card. My Country follows the same basic pattern as Paradise Island. It is free to download and install, but you can buy in-game cash to speed things along. 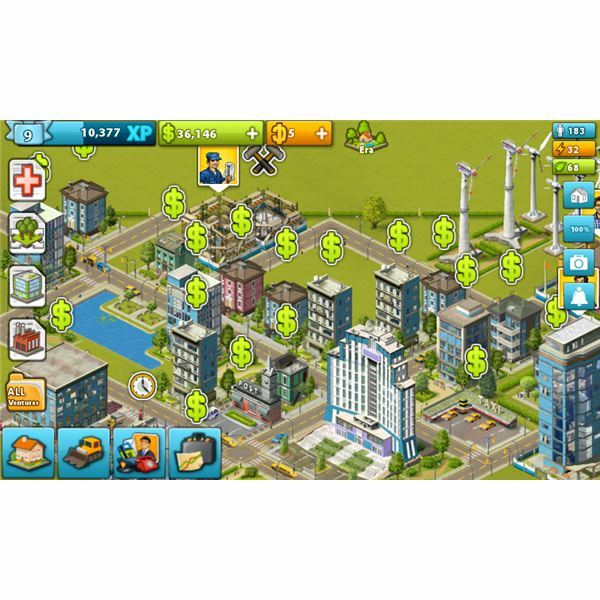 Everything you build will generate cash and XP, but it all takes time, so you are encouraged to dip in and out of the game every few hours to scoop up your earnings and kick off new construction projects. The scope is much greater than Paradise Island and there are some new concepts at work here. The most obvious fresh idea is Professionals. Many of your buildings and enterprises will require specific staff before they can operate. This encompasses everyone from teachers and taxi drivers to janitors and CEOs. Each professional requires three objects before they can be hired and the objects are acquired by building new businesses, upgrading buildings and collecting cash from your ventures. For example a CEO requires a telephone, a file box and a notepad. Each of your buildings can be upgraded in some way and many of them have multiple layers of upgrade. The majority of businesses run contracts so you’ll have to outlay some starting cash in order to earn a return. As you upgrade them you’ll get the option to fund bigger contracts that take longer to complete, but pay out more profit. There are also a number of Ventures which essentially offer you bonuses for completing specific tasks such as opening a Shoe Factory. As you gain XP you’ll advance up the levels and gain access to new types of buildings. The two types of currency in the game are Game Dollars and Country Bucks. You’ll earn the dollars at a pretty fast rate as you play, but the bucks are a lot harder to come by. The option to spend real money to get them will prove tempting and this is obviously by design as the developer looks to turn a decent profit. There are certain buildings and shortcuts to hiring that you can only use if you have bucks to spend. Irritatingly the reminders to buy them are pretty regular so be careful if you don’t want to spend any real cash. Your alternative is to be patient. You will earn enough cash over time and that elusive file box or plunger will come up eventually. You should also make sure you complete Ventures when you can because they often carry good bonuses. Check back regularly and tap the dollar signs above your buildings to collect your earned cash and XP. You don’t have to actually click on the dollar and XP icons that spring out (they will be automatically added if you leave them alone). Remember that businesses that run contracts are the real big earners. Housing won’t bring in much money. 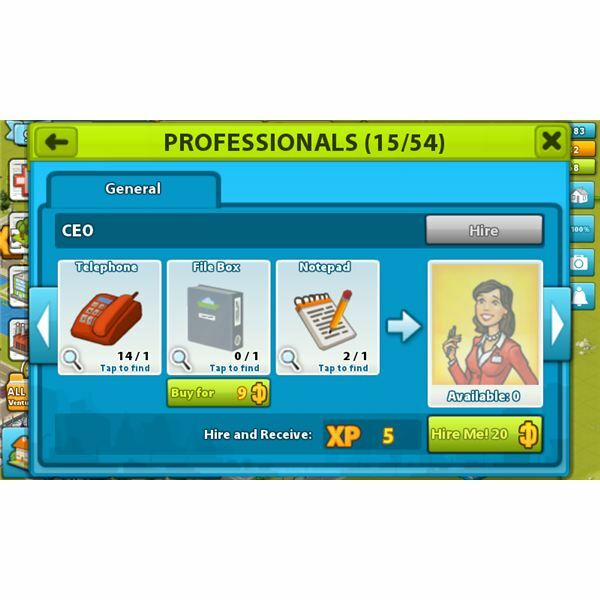 When you collect cash make sure that you click the blue briefcase icon above the contract businesses and pay your cash to start off new contracts before you spend everything. Do not spend any Country Bucks on anything that can be paid for with Game Dollars. You will earn plenty of dollars as the game progresses but you won’t earn many bucks. Save them for buildings that can only be built by spending them and for kitting out and hiring professionals. Remember you won’t be able to open that new Driving School until you have three Teachers and a Driving Instructor. It could sit uselessly while you wait for a Digital Watch to equip your Driving Instructor. You can check what you need by clicking on the Professional and you can see what will potentially provide that item by clicking on the item. For example the Digital Watch can only be gained by building an Illuminated Fountain, collecting from a Shoe Factory or building a Villa. Some items are very rare; with others you’ll end up collecting piles of them. When you get a new item that allows you to hire a professional don’t click on the automatic pop-up. Some items can be used by more than one professional and the game won’t necessarily suggest the one you’ve been waiting for. Some buildings have multiple upgrade options. For example with Small Office Buildings you can upgrade by adding floors, increasing territory and finally adding a new roof. Make sure you check out all the options in each building’s upgrade screen as they aren’t immediately obvious. Go for a couple of Small Office Buildings and a Business Center early on and upgrade them as much as possible. They’ll start to bring in big profits. Delay going for things like the Driving School because you’ll need loads of staff. Make sure you build extra power and plenty of parks as you go along. The factories require a lot of cash and staff but they offer much longer term contracts so they’re good if you don’t want to have to check back so often to collect your profits. Always check what you’ll need for a new building and think about what will pay off in terms of object bonuses. The collect option from a business that produces items is the best as you can do that over and over. Having to build something to get the item, only to get the wrong item, or discover that it also needs a professional you don’t have, is very frustrating. If you want to be able to play My Country for extended sessions then you’ll need to spend real cash or wait until your city is huge. It can be massively frustrating waiting for a specific item that refuses to come up. Especially if you’ve spent a fortune on a building and it only needs one item so you can hire the professional you need to open it. It feels as though the game is deliberately not giving you what you want sometimes and it could indeed be a developer strategy to encourage you to spend real money. The game is also a little buggy which is perhaps to be expected with a game on this scale. On my HTC Desire it occasionally crashes or refuses to load. For the most part a restart gets round the problem. Despite the frustrations with My Country I am addicted and I’m checking it several times a day to rake in the profits and extend my creation. It’s a stand out option on Android right now and it definitely has more depth than most of your other options. I’m still a relative newcomer so I’ll add more My Country tips as I discover them. In the meantime if you have any hints to share or suggestions then please post a comment.